The problem for the US and a spending cap, is that about 30% of the US Budget is categorized as “Discretionary Spending”. The rest includes interest and “Mandatory Spending”, much of which is Entitlements. Obviously a spending cap on interest is an impossibility, while Mandatory Spending is facing a demographic wave and cannot be capped. The only way to put a lid on interest rate increases is to be fiscally responsible, in a world that’s fiscally nuts. To cap Mandatory Spending, Entitlements must be reduced to reflect future and past increases in life expectancy. 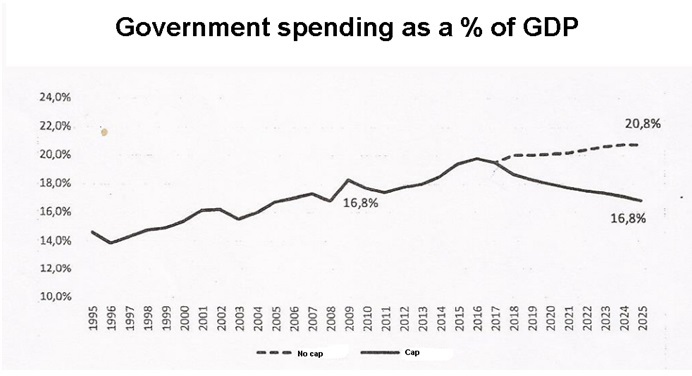 An overall cap on spending will not work, without major changes to Entitlements. Merry Christmas to all, and particularly to you and your family, Dan!! !